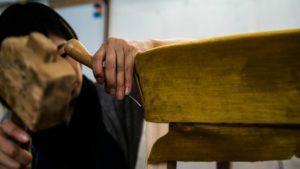 For me, one of the little delights in traditional upholstery is the knowledge you are using hand tools which have remained almost unchanged over the centuries. Fashioned in another era, I like their bygone charm. Of course, they’re unchanged because they do the job perfectly. 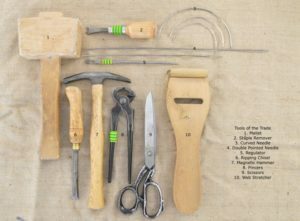 There is an essential list of tools that allow the upholsterer to practise their trade and they all fit into a small tool bag. 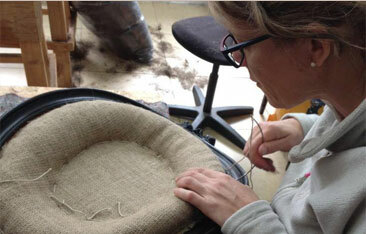 With this bag in hand it’s possible to undertake the vast majority of upholstery jobs, from a minor repair to the full scale restoration of a large Victorian sofa. There can be few other trades that allow so much to be done with so few tools. Less than a couple of hundred pounds will set you on a creative journey of discovery, occasional frustration but always a satisfying sense of achievement as well as pride when all your friends and family admire your work. Over the next few weeks we’ll post a series of brief videos and descriptions of each of the tools and their uses. Always buy the best tools you can afford, they are an investment, but they will pay you back many times over. With good care most will last you a lifetime. Get yourself a decent tool bag and start collecting! I’m a beginning student of traditional upholstry in the US, I’m wondering why the horses for working off ground level appear to have fabric under the “box” part for the furniture legs. Is this the case? If so, why and how did it get there? The work horses in the US only come “bare”. Hello, I’m not sure if you mean the trestles which we use to stand furniture on? 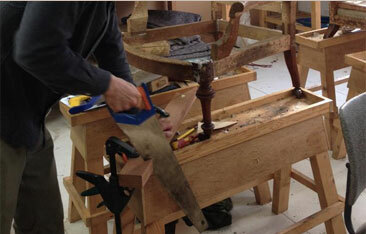 We sometimes pad table tops for working on furniture with show wood. We have also been known to customise trestles and to attach tack/needle pouches to the sides but generally we just have the plain wooden trestles, ‘bare’ as they are made.